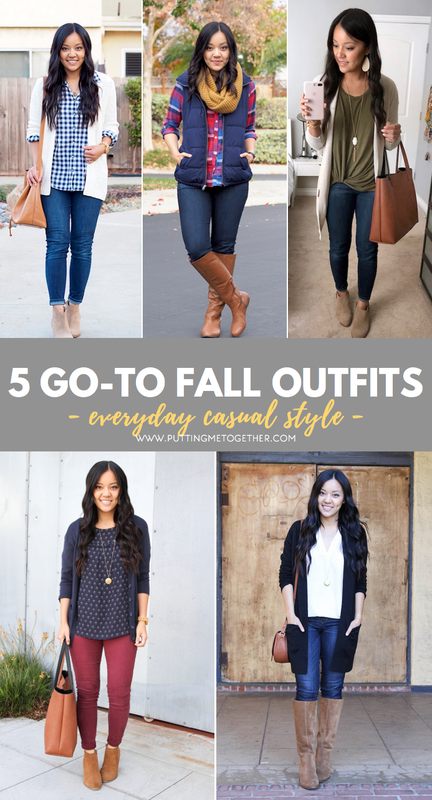 Last month I started a mini series with 5 go-to outfits at different levels of casual to dressy. 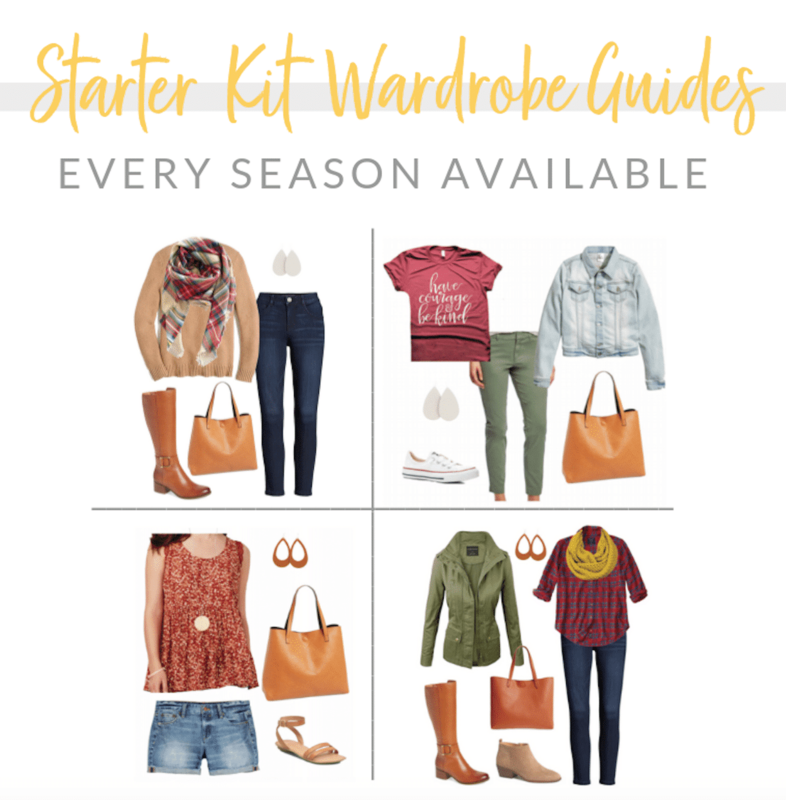 These are my go-to outfits and outfit formulas for different life situations. The first one was 5 Casual Go-To Outfits for Fall that you could default to while running weekend errands or wrangling kids. Today is part 2! I didn’t quite know what to title today’s looks. In my own head I call them “put together casual looks” or “out and about looks” which isn’t a very helpful distinction because last month’s batch of very casual looks could be titled the same thing. 😛 Like I said, it’s just the title I use in my own head. But regardless of what you wanna call them, the definition is outfits that are casual, but something I’d wear when hanging out with adults. So like, lunch out with friends, dinner out with friends + kids, or meetings for my super casual work environment. They’re still casual, but they’re a smidge of a step up from last month’s outfits. 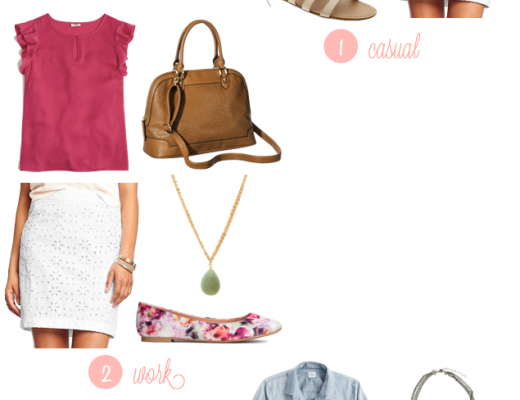 These are the outfit formulas I tend to follow when I’m about to head to lunch or a meeting. 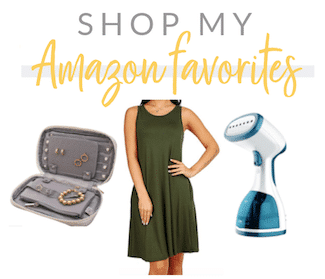 I can swap in different tops, different colored completer pieces, or different colored jeans, but these are 5 formulas I can always count on to get dressed in a snap! 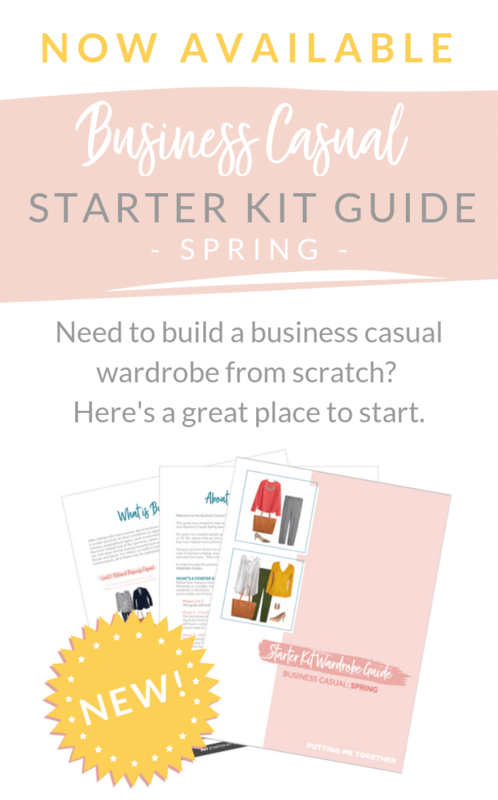 This is my main go-to formula, and it works with so many different printed button ups and different colored cardigans. 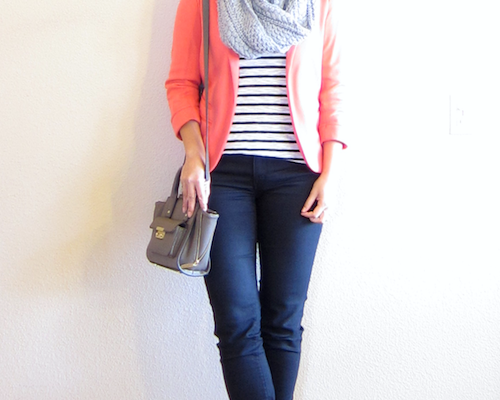 I get complimented often when I’m wearing a rendition of this outfit formula, and it’s such an easy outfit to do! A note about button ups: I used to really dislike them before finding materials/fit/drape that I liked. Button ups are not all the same. They come in a variety of weights, with some being really stiff to really flimsy to all sorts of weights in between. I always prefer ones that are on the softer, more drapey end of the spectrum so that the collar isn’s stiff and bothersome. But I don’t want them so thin that they don’t lay well or are too flimsy to stay put under pullover sweaters. If you like the look but haven’t found ones you like wearing, keep trying! They’re not all the same! Also, see how I remixed this navy gingham button up 7 ways for fall HERE. Whether it’s a twist tee or a plain v-neck tee, throw on a cardigan or utility jacket for warmth. Then, to add presence and polish to the outfit, pull it together with booties/boots and some jewelry! 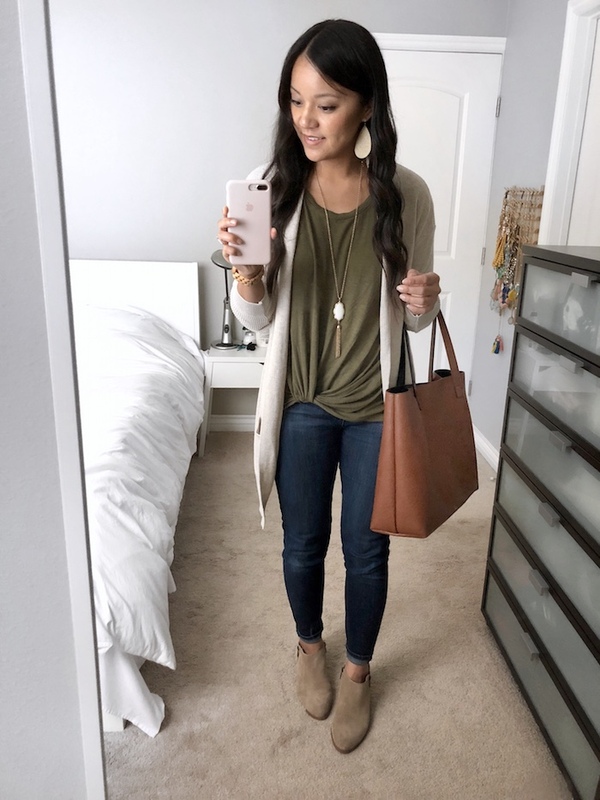 I’ve worn this exact outfit with white slip-on sneakers while running errands, but swapping in booties sharpens the look and takes it up a notch. I love this combo! I used to think vests were pointless–they didn’t even keep your arms warm :P–but a few years ago I became a convert! I own vests from Old Navy and J.Crew Factory. The one above is a puffer vest from Old Navy, which may not work best for those who don’t want to add bulk to the top half. It sure is cozy and warm with fleece lining though! 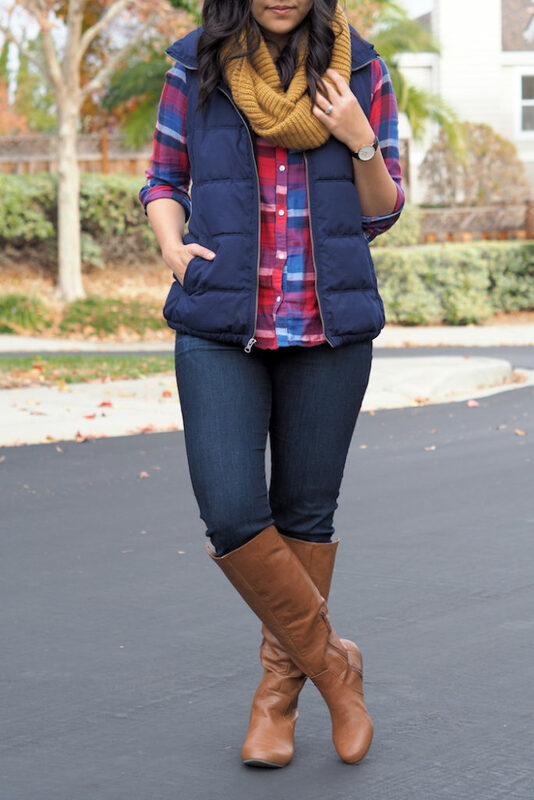 An alternative is a quilted vest which is usually less bulky and has more seaming at the waist, which should be more figure flattering, giving curves and definition. 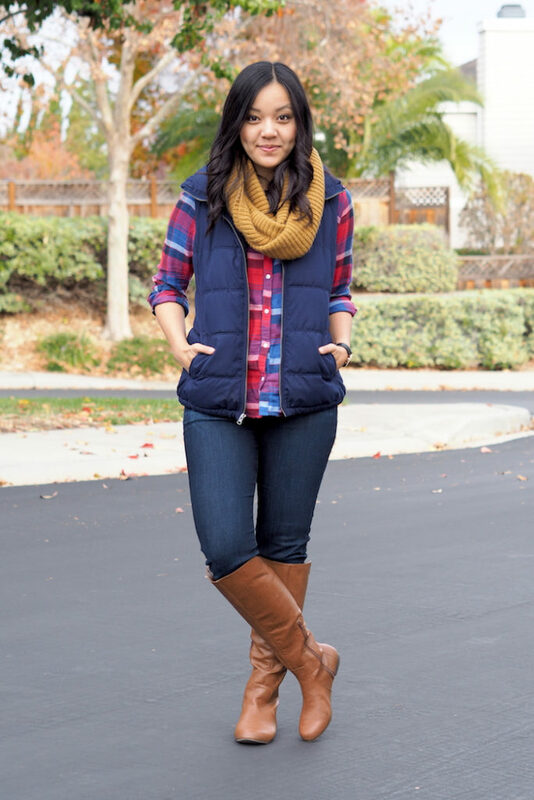 I have THIS quilted vest from J.Crew Factory. See it on me HERE. This year Old Navy came out with some quilted vests as well. I haven’t tried them yet, but you can find them HERE. Top off your whole look with a scarf! It makes the entire outfit! Every season I have a few printed blouses that can be thrown on in a pinch. Blouses are a step up from t-shirts in terms of material, and printed ones are easy because they’re visually interesting without having to layer or add accessories to. 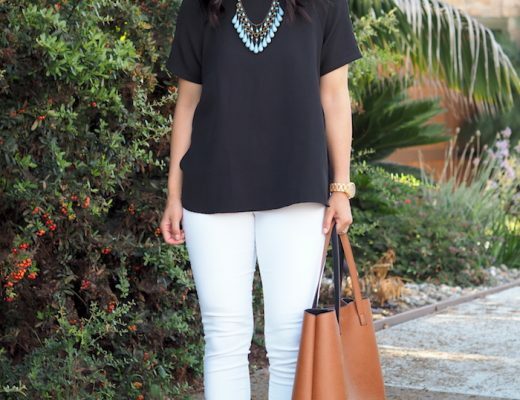 If you want to layer over them or accessorize more, you totally can, but the ease of printed blouses is that you don’t need to. Just throw it on and go as is! This top’s not only got a cute print, but it has other details like the ruffles along the chest and sleeves and the minor bell sleeves. 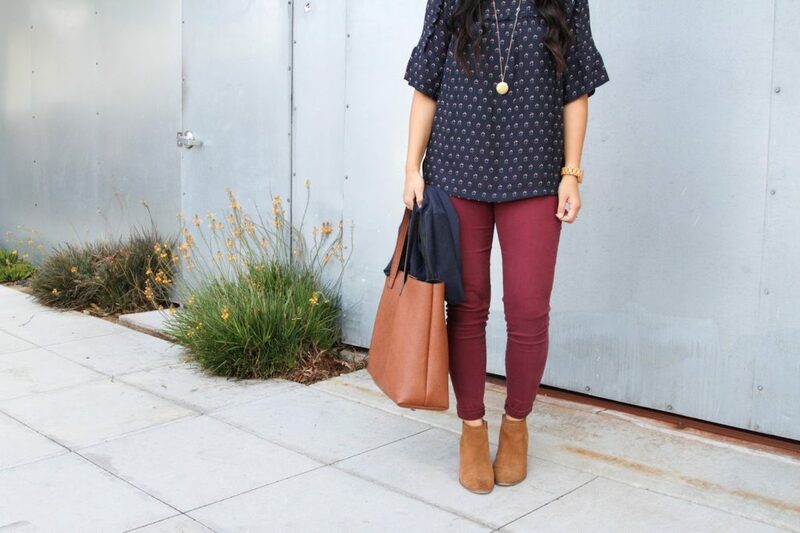 To change up that jeans + top look, wear colored jeans instead! Just as easy as regular jeans, but looks a whole lot more interesting and like you put way more effort into it. 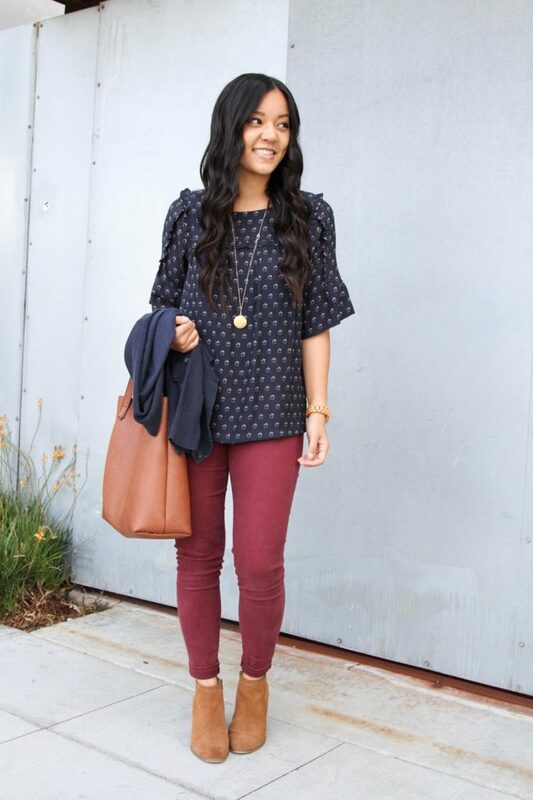 A plain blouse with jeans is my last go-to look in the fall when I’m headed to meetings or lunch with friends. With a solid top like this, I like to anchor the outfit with taller boots to give the whole thing more visual interest. (I explained this all on Instastories a few weeks ago and showed this outfit with taupe booties, black booties, and these boots.) For completer pieces, a utility jacket would work over this, but of course I went with an oversized cardigan as my go-to look since they not only keep me warmer, but they’re easier to move around in. I love the idea of easy outfits! 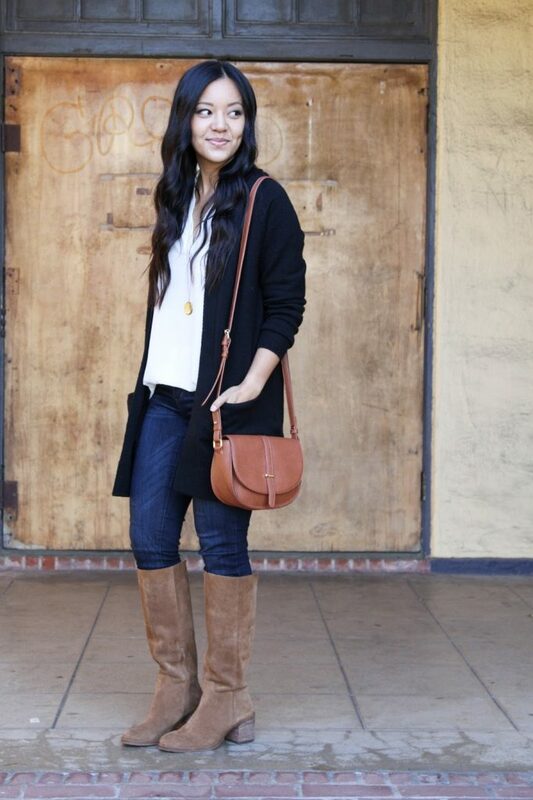 And I really need to branch out my cardigans a little…this is the perfect time to wear them! You’re absolutely right! Cardigans rule! I have adopted your method for daily dressing and it has transformed my life! 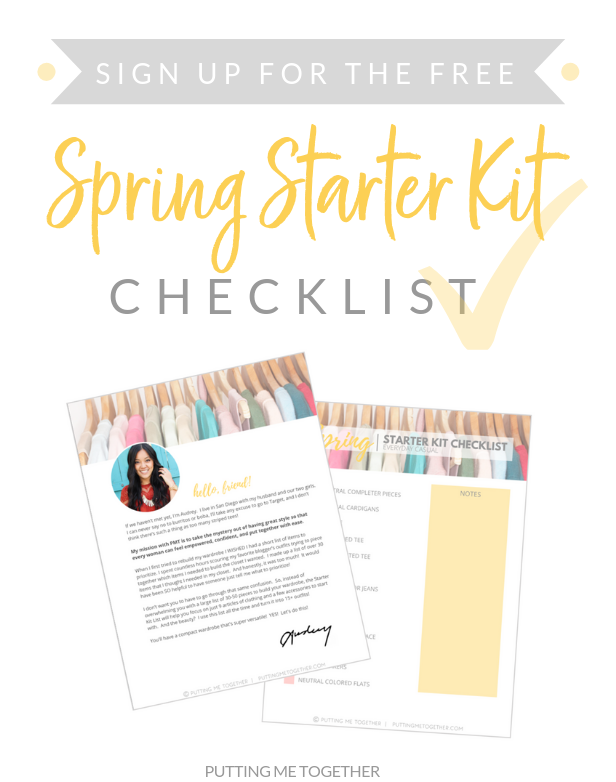 I have also created a capsule wardrobe that makes it all a breeze. Thanks for all the great suggestions. I now have a selection of completer pieces and they totally do make the outfit, but yes, in a pinch, I’ll grab a cardigan to get me out the door in a hurry. Thanks for all the inspiration! I would love to see a tutorial from you on how to properly roll up the sleeves on a button down shirt! For some reason mine never look good and then always end up falling down by the end of the day. 🙁 It would be great to get some tips on how to roll them up on their own, and how to roll them up with a sweater on top as well. 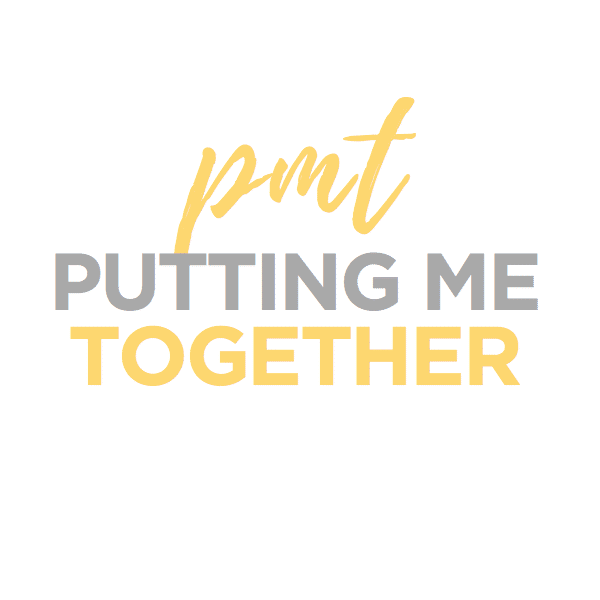 I have learned so much from this blog, following for over 6yrs now, and I wanted to give back by sharing a tip I do with my scarves. Instead of tie or knotting my scarves, I use an ordinary hair tie think old school round elastic cover hair tie as in goody brand or Walmart brand. 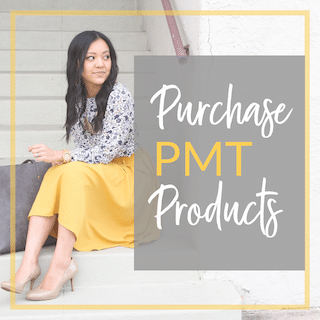 This is great for bulky or blanket scarves, just hold the two ends together with a round hair tie looped twice around and hide under the triangle part of the scarf like you taught us. I wrap the scarf ends same as making a ponytail. Hope this makes scarves fun to wear. Happy Fall Yall. That’s a great tip! Thank you so much!